Researchers at Purdue University have overcome a major obstacle in reducing the cost of "solid state lighting," a technology that could cut electricity consumption by 10 percent if widely adopted. The technology, called light-emitting diodes, or LEDs, is about four times more efficient than conventional incandescent lights and more environmentally friendly than compact fluorescent bulbs. The LEDs also are expected to be far longer lasting than conventional lighting, lasting perhaps as long as 15 years before burning out. "The LED technology has the potential of replacing all incandescent and compact fluorescent bulbs, which would have dramatic energy and environmental ramifications," said Timothy D. Sands, the Basil S. Turner Professor of Materials Engineering and Electrical and Computer Engineering. The LED lights are about as efficient as compact fluorescent lights, which contain harmful mercury. But LED lights now on the market are prohibitively expensive, in part because they are created on a substrate, or first layer, of sapphire. The Purdue researchers have solved this problem by developing a technique to create LEDs on low-cost, metal-coated silicon wafers, said Mark H. Oliver, a graduate student in materials engineering who is working with Sands. Findings are detailed in a research paper appearing this month in the journal Applied Physics Letters, published by the American Institute of Physics. LEDs designed to emit white light are central to solid-state lighting, semiconducting devices made of layers of materials that emit light when electricity is applied. Conventional lighting generates light with hot metal filaments or glowing gasses inside glass tubes. The LEDs have historically been limited primarily to applications such as indicator lamps in electronics and toys, but recent advances have made them as bright as incandescent bulbs. The light-emitting ingredient in LEDs is a material called gallium nitride, which is used in the sapphire-based blue and green LEDs, including those in traffic signals. The material also is used in lasers in high-definition DVD players. The sapphire-based technology, however, is currently too expensive for widespread domestic-lighting use, costing at least 20 times more than conventional incandescent and compact fluorescent light bulbs. One reason for the high cost is that the sapphire-based LEDs require a separate mirrorlike collector to reflect light that ordinarily would be lost. In the new silicon-based LED research, the Purdue engineers "metallized" the silicon substrate with a built-in reflective layer of zirconium nitride. "When the LED emits light, some of it goes down and some goes up, and we want the light that goes down to bounce back up so we don't lose it," said Sands, the Mary Jo and Robert L. Kirk Director of the Birck Nanotechnology Center in Purdue's Discovery Park. Ordinarily, zirconium nitride is unstable in the presence of silicon, meaning it undergoes a chemical reaction that changes its properties. The Purdue researchers solved this problem by placing an insulating layer of aluminum nitride between the silicon substrate and the zirconium nitride. "One of the main achievements in this work was placing a barrier on the silicon substrate to keep the zirconium nitride from reacting," Sands said. Until the advance, engineers had been unable to produce an efficient LED created directly on a silicon substrate with a metallic reflective layer. 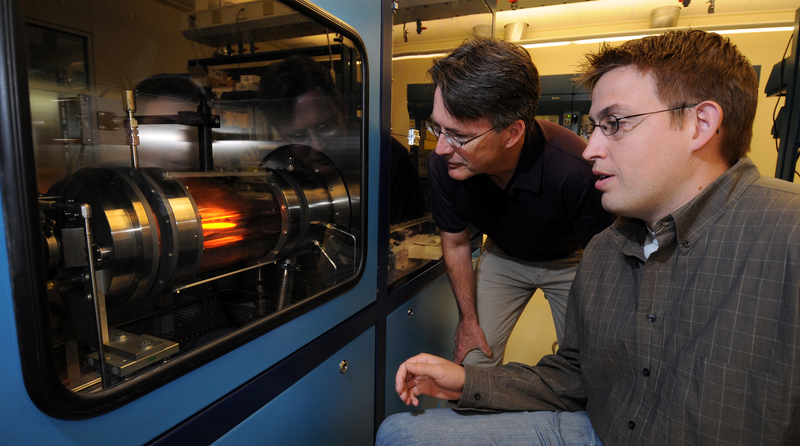 The Purdue team used a technique common in the electronics industry called reactive sputter deposition. Using the method, the researchers bombarded the metals zirconium and aluminum with positively charged ions of argon gas in a vacuum chamber. The argon ions caused metal atoms to be ejected, and a reaction with nitrogen in the chamber resulted in the deposition of aluminum nitride and zirconium nitride onto the silicon surface. The gallium nitride was then deposited by another common technique known as organometallic vapor phase epitaxy, performed in a chamber, called a reactor, at temperatures of about 1,000 degrees Celsius, or 1,800 degrees Fahrenheit. As the zirconium nitride, aluminum nitride and gallium nitride are deposited on the silicon, they arrange themselves in a crystalline structure matching that of silicon. "We call this epitaxial growth, or the ordered arrangement of atoms on top of the substrate," Sands said. "The atoms travel to the substrate, and they move around on the silicon until they find the right spot." This crystalline formation is critical to enabling the LEDs to perform properly. "It all starts with silicon, which is a single crystal, and you end up with gallium nitride that's oriented with respect to the silicon through these intermediate layers of zirconium nitride and aluminum nitride," Sands said. "If you just deposited gallium nitride on a glass slide, for example, you wouldn't get the ordered crystalline structure and the LED would not operate efficiently." Using silicon will enable industry to "scale up" the process, or manufacture many devices on large wafers of silicon, which is not possible using sapphire. Producing many devices on a single wafer reduces the cost, Sands said. Another advantage of silicon is that it dissipates heat better than sapphire, reducing damage caused by heating, which is likely to improve reliability and increase the lifetime of LED lighting, Oliver said. The widespread adoption of solid-state lighting could have a dramatic impact on energy consumption and carbon emissions associated with electricity generation since about one-third of all electrical power consumed in the United States is from lighting. "If you replaced existing lighting with solid-state lighting, following some reasonable estimates for the penetration of that technology based on economics and other factors, it could reduce the amount of energy we consume for lighting by about one-third," Sands said. "That represents a 10 percent reduction of electricity consumption and a comparable reduction of related carbon emissions." Incandescent bulbs are about 10 percent efficient, meaning they convert 10 percent of electricity into light and 90 percent into heat. "Its actually a better heater than a light emitter," Sands said. By comparison, efficiencies ranging from 47 percent to 64 percent have been seen in some white LEDs, but the LED lights now on the market cost about $100. "When the cost of a white LED lamp comes down to about $5, LEDs will be in widespread use for general illumination," Sands said. "LEDs are still improving in efficiency, so they will surpass fluorescents. Everything looks favorable for LEDs, except for that initial cost, a problem that is likely to be solved soon." He expects affordable LED lights to be on the market within two years. Two remaining hurdles are to learn how to reduce defects in the devices and prevent the gallium nitride layer from cracking as the silicon wafer cools down after manufacturing. "The silicon wafer expands and contracts less than the gallium nitride," Sands said. "When you cool it down, the silicon does not contract as fast as the gallium nitride, and the gallium nitride tends to crack." Sands said he expects both challenges to be met by industry. "These are engineering issues, not major show stoppers," he said. "The major obstacle was coming up with a substrate based on silicon that also has a reflective surface underneath the epitaxial gallium nitride layer, and we have now solved this problem." The research, based at the Birck Nanotechnology Center and funded by the U.S. Department of Energy through its solid-state lighting program, is part of a larger project at Purdue aimed at perfecting white LEDs for lighting. The Applied Physics Letters paper was written by researchers in the School of Materials Engineering and the School of Electrical and Computer Engineering: Oliver; fellow graduate students Jeremy L. Schroeder, David A. Ewoldt, Isaac H. Wildeson, Robert Colby, Patrick R. Cantwell and Vijay Rawat; Eric A. Stach, an associate professor of materials engineering; and Sands. An intermediate ZrN/AlN layer stack that enables the epitaxial growth of GaN on (111) silicon substrates using conventional organometallic vapor phase epitaxy at substrate temperatures of 1000 °C is reported. The epitaxial (111) ZrN layer provides an integral back reflector and Ohmic contact to n-type GaN, whereas the (0001) AlN layer serves as a reaction barrier, as a thermally conductive interface layer, and as an electrical isolation layer. Smooth (0001) GaN films less than 1 micron thick grown on ZrN/AlN/ Si yield 0002 x-ray rocking curve full-width-at-half-maximum values as low as 1230 arc sec. © 2008 American Institute of Physics.